The first time that I saw the Golden Eardrops from a distance I was wondering what kind of crazy mustard is that? Then as I came closer I realized that it was yellow bleeding hearts with the flowers upside down, or maybe it is really right side up. The ferny foliage and the exotic looking flowers have made a lasting impression on me. Dicentra chrysantha grows fantastically following a fire and maintains residual pockets where the conditions are right. In the drier south Golden Eardrops grows on north facing slopes on well drained shale. In the north it grows in south facing pockets up to 5000 feet. Surprising to me because of the look of the flowers Golden Eardrops are in the Poppy Family. Heat scarification is necessary to get the seeds to germinate. 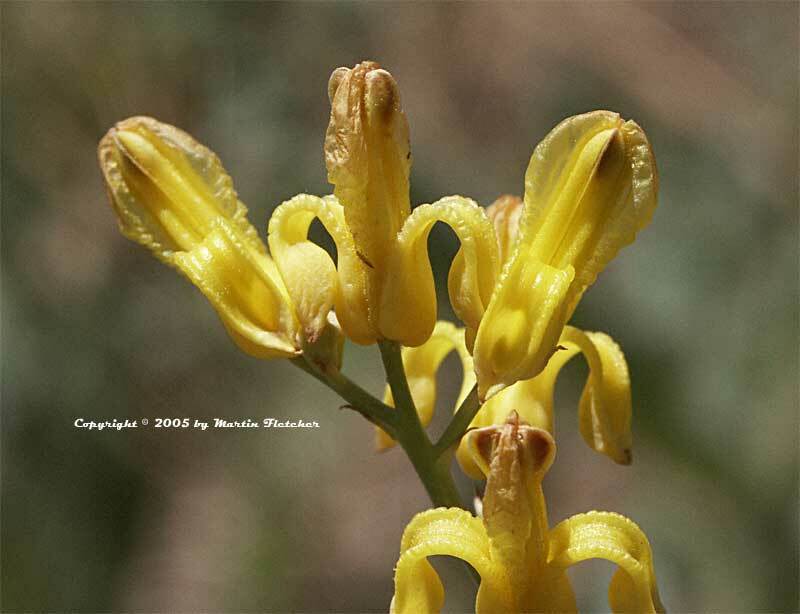 Plants are common in fire areas in the middle elevations of the Coast Ranges and the Sierra's. This photograph was taken on the Sherman Pass Road above the Owens Valley. Golden yellow flowers of Dicentra chrysantha the Golden Eardrops. High resolution photos are part of our garden image collection.